If you’ve ever looked for a washbasin, then you know: the selection is huge. Add to that the search for the right faucet to match your washbasin in terms of design and techical fit, and suddenly things get really complicated. At worst you’ll be dissatisfied after installation because of splashing or lack of comfort. So how do you find the perfect combination of washbasin and faucet? GROHE now makes it easier than ever for you to find the perfect combination of washbasin and faucet – with the GROHE PerfectMatch™ website and app for iOS & Android. Regardless of whether you are looking for a washbasin to fit your desired GROHE faucet, or an exclusive GROHE faucet for your washbasin, with GROHE PerfectMatch™ you’re guaranteed to find just the right combination. With GROHE PerfectMatch™, you can easily browse through all the various pre-tested combinations in the comfort of your own home. How about an oval washbasin with a faucet featuring the modern GROHE Essence design? Or maybe a square washbasin with an elegant GROHE Allure faucet? You can choose among popular washbasins from six top brands as well as a large selection of GROHE basin mixers. With over 3,500 individual combinations tested already and more to come, you can always be confident of finding your perfect combination. You can save, print out, share or send via email your favourite combinations – making it easy to discuss your bathroom plans with your family or with the experts later in the shop. Quality takes top priority at GROHE. 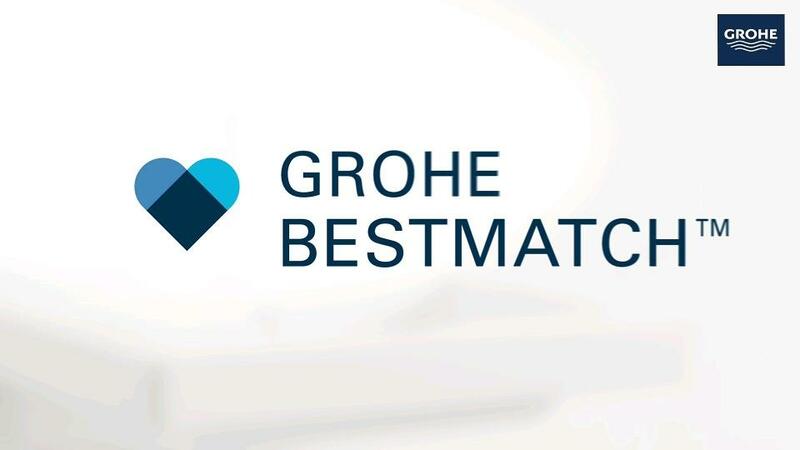 In the famous GROHE Laboratory, set up especially for GROHE BestMatch, experienced GROHE technicians take a close, precise look: Is the combination technically feasible? Is water splashing when you wash your hands? Can the user enjoy a high level of comfort and convenience when using the combination? At the same time, all the designs have been evaluated by our in-house GROHE design team. Only those combinations that pass the design match & technical test make it into GROHE PerfectMatch™. So you can count on the GROHE PerfectMatch™ results one hundred per cent!